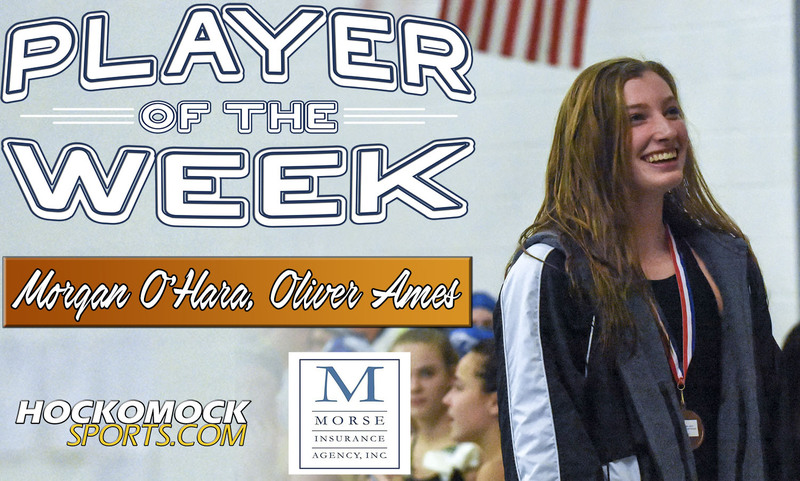 Oliver Ames junior Morgan O’Hara has been selected as the HockomockSports.com Player of the Week, presented by Morse Insurance, for Jan. 27 through Feb. 2. O’Hara is the 18th player chosen as Player of the Week for the 2018-19 school year and the eighth player in the winter season. O’Hara dominated the annual Hockomock Girls Swim Championships at Milford High this weekend, helping Oliver Ames win its first ever team title at the meet. O’Hara finished in first in all four of the events that she took part in (two individual races and two relays) and set new meet records in all four. The Tigers grabbed the lead only a few races into the meet and never looked back, finishing with 378 points as a team, which was more than 60 points better than second place Franklin. OA also won the Kelley-Rex dual meet title with a perfect 5-0 record. It wasn’t until the sixth race of the day that O’Hara first got into the pool, but she made an instant impact, winning the 100-yard freestyle in a meet record time of 53.54. It broke the record that she set last winter. Two events later, O’Hara was the anchor leg for the meet record-setting 200-yard freestyle relay team, which finished in 1:42.74, nearly five seconds better than the second place team from Attleboro. In the very next event, O’Hara showed her versatility by winning the 100-yard backstroke in a time of 59.12, more than three seconds better than the second place finisher and another time that eclipsed a meet record that she set last year. Although the title was mostly secured going into the final event, the 400-yard freestyle relay, OA made sure to finish in style, setting a fourth meet record with a time of 3:46.66. It was more than eight seconds better than the second place team from Franklin. O’Hara swam the anchor leg to close out the meet for the Tigers.